May 19th is Global Accessibility Awareness Day (GAAD) which focuses on getting people talking, thinking and learning about digital accessibility and users with different disabilities. 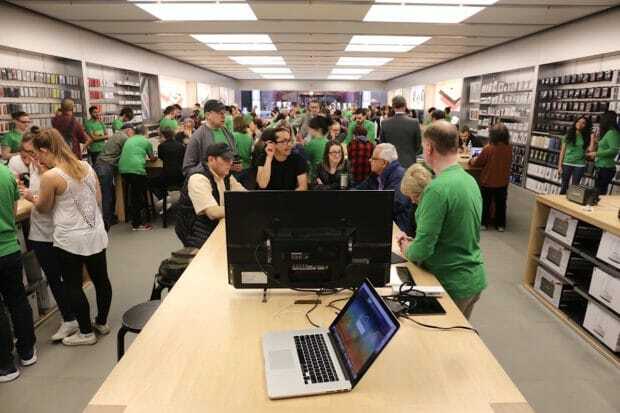 This year Apple stores across Canada hosted a series of workshops which focussed on various accessibility issues including hearing, vision and motor skills. I peddled down to the Eaton Centre on my bike that morning for a workshop focussed on helping those who live with hearing impairment. 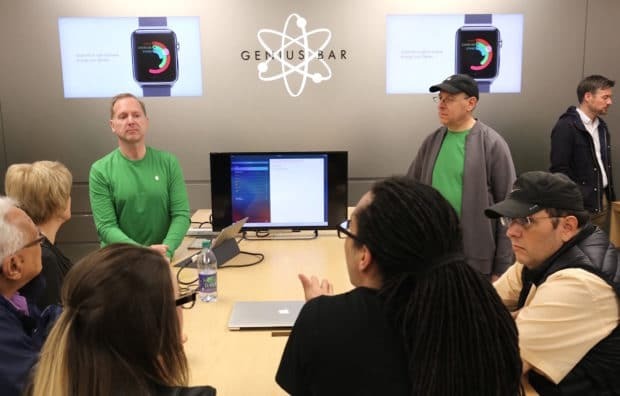 The class was hosted at the Apple Store’s Genius Bar by deaf employee Brian. During the one hour session he used a friendly sign language interpreter to answer questions from a curious group of tech geeks who are also hard of hearing. The most frequently used assistive feature on my Apple devices is FaceTime. Instead of hopping on a call with a client (where I often miss out on frequencies in their speech) it’s much easier to video conference call so I can read their lips as we flow through the conversation. FaceTime video calls let you communicate in more ways than one. Catch every gesture and facial expression – from raised eyebrow to ear-to-ear smile. Thanks to high-quality video and fast frame rate, FaceTime is also ideal for people who communicate using sign language. And because Mac, iPhone, iPad and iPod touch all come equipped with FaceTime, you can talk to iOS and OS X users across the street or across the globe as if you’re face to face. When you’re using headphones, you may miss some audio if you’re deaf or hard of hearing in one ear. That’s because stereo recordings usually have distinct left- and right-channel audio tracks. iOS can help by playing both audio channels in both ears, and letting you adjust the balance for greater volume in either ear, so you won’t miss a single note of a concerto or word of an audiobook. Apple has worked with top manufacturers (such as GN ReSound, Starkey and Oticon) to create hearing aids designed specifically for iPhone. These hearing aids deliver a power-efficient, high-quality digital audio experience, and will allow you to manage your hearing aid right from your iPhone. This new generation of tech savvy hearing aids offer users bluetooth compatibility so calls coming in from your iPhone go straight to your hearing aids. Those who are hard of hearing can now also listen to music on their iPhone or watch movies on an iPad without the use of headphones! Each brands made for iPhone hearing aid app allows its users to quickly check their battery life, help filter out ambient noise and makes listening to speech much clearer. Watch movies, TV shows, and podcasts with closed captions. Just look for the CC icon to buy or rent captioned movies from the iTunes Store or find captioned podcasts in iTunes U. Download straight to your iOS device to watch on the go. iOS also supports open captions and subtitles. You can even customize captions with different styles and fonts. Apple Watch also features Taptic Engine, a linear actuator built inside the device that produces haptic feedback. You’ll feel a gentle tap on your wrist every time a notification comes in. And you can turn on Prominent Haptic to pre-announce some common alerts. So you’ll never miss messages, mail, and other important events that you otherwise might miss with a sonic alert. Learn more about Apple’s Hearing Accessibility initiative and check out the App Store which features a collection of accessibility apps, highlighting iOS developers who are helping to make the world better for everyone, especially those hard of hearing. 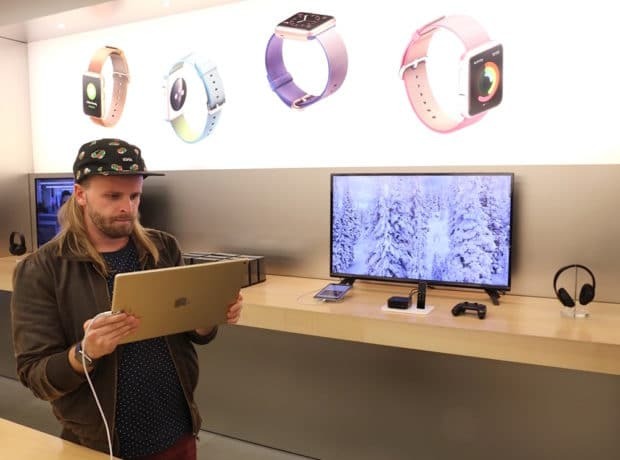 You can also check out when the next accessibility workshop is happening at an Apple Store near you.